Bolder in foliage than the well known ‘Gold Dust’ plant, Aucuba japonica picturata is a species that adds vibrancy to a dark position in the garden. 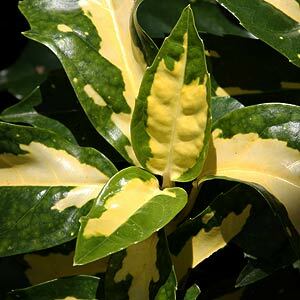 A medium sized evergreen shrub ‘Picturata’ is grown for the large glossy foliage with a bold splash of gold in the centre of each leaf. Reaching around 2 – 3m in height with a similar spread this a shade loving plant in Australian conditions. Flowers are insignificant however they are followed by attractive red berries. A very useful landscaping plant for shaded positions. With strongly marked foliage Aucuba japonica ‘Picturata’ is a bolder addition to the garden, a little more striking than the common form. Also excellent in a container in a shaded position, where the striking foliage adds a lift to dark areas. A humus rich deep soil is best. Water in new plants with a liquid seaweed fertiliser to promote good root growth. Watering during long dry spells will be required although in a good shaded position you will find that little extra water is required once established. Aucuba japonica ‘Picturata’ can be pruned after the danger of frost is over. Older plants can be pruned back fairly hard if required.